Lewisburg High School Patriot Vision broadcast journalism students display their awards at the Mississippi Scholastic Press Association Spring Convention on April 1 at Ole Miss. Patriot Vision won this year's top award for Best Newscast in Mississippi. Pictured (Top): are Joshua Parks, Braden Potts, Hayden Turner, Logan Greenfield, Cooper Little, Janaya Meredith, John David Carter. (Bottom): Emma Pennington, Londyn Bakeris, Madison Greenfield, Kayce Stephan, Oliver Childers. Center Hill senior Emily Merz was recognized as an All-Mississippi honoree in journalism at the Mississippi Scholastic Press Association Spring Convention on April 1 at Ole Miss for her work on the Pony Express newspaper and Mustang TV. Horn Lake sophomore Ashanti Wright won the award for Mississippi's Best High School News Anchor at the Mississippi Scholastic Press Association Spring Convention on April 1 at Ole Miss for her work on Eagle Vision. Patriot Vision is celebrating its 10th year of high school broadcasting and this is the first time any DeSoto County school has earned the Best Newscast award. The MSPA Spring Convention and Awards day was held in Oxford at the University of Mississippi on April 1. Patriot Vision’s Best Newscast award is considered to be the state championship of high school broadcasting. With 35 schools attending the convention and 20 broadcasts competing in the “Best of MS” competition, it is an incredible honor for the Patriot Vision team and Lewisburg High. “This year’s contests were among the most competitive we’ve ever had, so the dividing lines between first and 10th place can be razor thin,” according to MSPA Director, R.J. Morgan. The award announcement came as a shock to Lewisburg Broadcast Journalism advisor Rodney Carver. Most of the schools in the broadcasting category at the annual journalism competition typically produce one pre-recorded episode per week. Patriot Vision has been the only daily, live broadcasting program in Mississippi for the past two years. DeSoto County Schools led the way at the state competition, winning 11 of the 20 “Best of MS” awards available in broadcasting. In addition to Patriot Vision’s overall award, the team won awards for Mississippi’s Best Daily Newscast, Best Sports Reporting, Best Social Media Presence, and Best Integrated Marketing Campaign. Horn Lake’s Eagle Vision won the awards for Best Creativity and Best Long Form Story. Center Hill won the award for Best Opening Sequence for their daily episode video introduction for MustangTV. Several DeSoto County students picked up individual awards for outstanding work in specialized categories. Horn Lake sophomore Ashanti Wright was named Mississippi’s Best High School News Anchor, a category in which three of the five state finalists were from DeSoto County, including Lewisburg’s Oakley Laughter and Avery Hughes. Lewisburg junior Katie Ditchkus won the award for Best Sports Story, and Lewisburg senior Landon Pugh placed first for Best Public Service Announcement. New to the MSPA this year was the statewide recognition of 10 students who represent the absolute finest examples of high school journalists currently enrolled in Mississippi high schools. 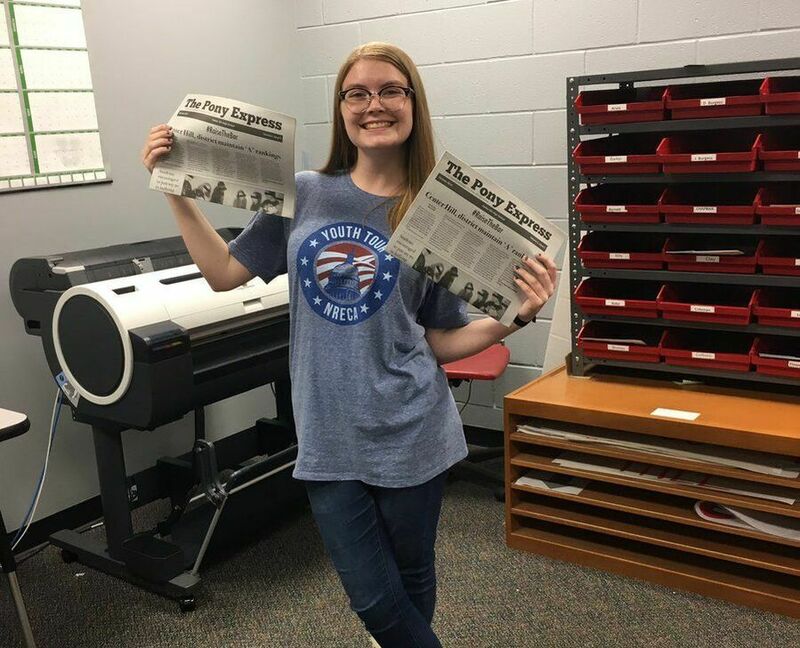 Center Hill senior Emily Merz was selected as one of the 10 All-Mississippi honorees for her work in both broadcasting and print as the Editor-in-Chief of the school’s Pony Express newspaper. DeSoto Central High School advisor Margaret Falatko was awarded the $1,000 MSPA technology grant for the school’s JagTV program at the convention’s advisor luncheon. Carver was thankful for all that the MSPA does to acknowledge the work that high school journalists do across the state. “These awards are the culmination of all the hard work these students do throughout the year, so whether it’s athletics or any other school activity, I always think it’s great when someone is able recognize those students and teams who rise to the top of their field,” Carver said. A complete list of this year’s winners and finalists can be found at mississippischolasticpress.com. Londyn Bakeris is a junior in Lewisburg High School’s Patriot Vision broadcast journalism program.